The Science Fiction Project is an ongoing series of short shadow theatre happenings that examine the concepts of community, environment, identity and human conditions, utilizing the conventions of Science Fiction. 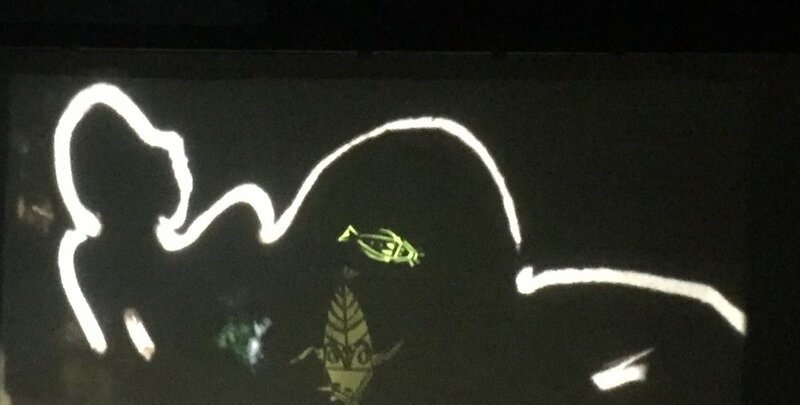 Created and directed by Ellen Sebastian Chang, Installment 1 + 2 was a one-night-only event that revealed a making of a modern creation myth, weaving personal and collective dreams and oral traditions in Africa. The story - what Chang coined as “Afrofuturist Myth Making” - unfolded against the backdrop of interplaying shadow and light choreographed by Larry Reed and improvised live soundscape of the genre defying music duo, Black Spirituals. Interdisciplinary musician/storyteller Amber McZeal takes the center stage as the Modern Griot (storyteller/historian/poet/musican in West Africa) guiding you on a journey of how-we-all-got-here. The video featured in Installment I is based on “Poison Fish,” a short story by Nnedi Okorafor, a Nigerian-American Science Fiction writer. It was directed by Ellen Sebastian Chang and Larry Reed, and developed in collaboration with Brendan Aanes, Rotimi Agbabiaka, Ya Wen Chien, Zakiya Harris, Caryl Kientz, Zena Konjo, Shasha Li, Erin Malley, I Made Moja, Hamid Rahmanian and Catlin Seavey.